Airborne operations are often associated with elite troops, carrying out daring missions. Eben-Emael, Crete, the D-Day landings, Arnhem, ... all of them have become the stuff of legend. A wargame scenario involving an airborne landing always poses some interesting challenges mechanics-wise. One of the aspects of an airborne deployment is the unpredictability of where the troops will land, and I think it deserves attention in a wargame as well. The first game I played (back in the 80s) that involved airborne landings was Avalon Hill's Air Assault on Crete. This is a classic hex-and-counter wargame, with a map depicting the northern coast of the island. 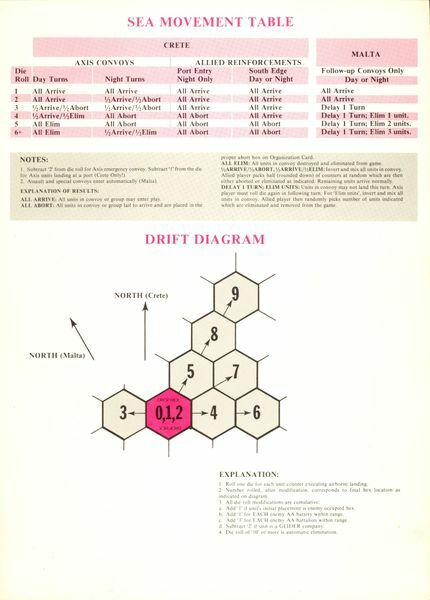 German airborne units were placed in a landing hex, after which a die was rolled and the counter was placed in its final landing hex using a drift diagram, as shown below. The die modifiers due to nearby Anti Aircraft guns always seemed very realistic to me. The non-symmetric drift diagram implied prevalent winds. 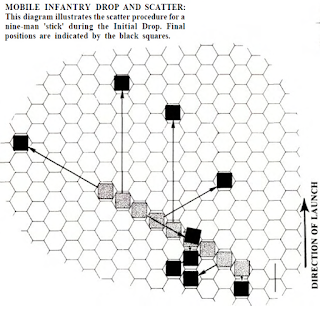 And surely, given the reputation of Avalon Hill games, this whole procedure was what could be expected in a serious wargame. I think it was in an issue of White Dwarf during the early 90s, when I read rules involving drop pods for the 6mm game Space Marine. To place the pods on the table, one had to drop paper chits from a certain height above the gaming surface, and wherever the paper chits landed, that was the location of the drop pod. The flimsy pieces of papers would "flutter" down, making the exact landing point quite unpredictable. I still remember being surprised by such a procedure. Surely the sophisticated wargamer would not use such a "stupid" rule? This seemed so different compared to the almost precise analysis of the drift diagram in Air Assault on Crete, that I didn't realize this procedure was just another randomizer, albeit an analogue one instead of one involving hexes and dice. I could have settled for a mechanic involving a D12 clockface direction for deviation and a 2D6 for distance, as was used in some other GW scattering procedures of the time. But dropping pieces of paper? It was only much later when I learned that this mechanic had a long history in miniature wargaming, and was described in Donald's Featherstone book Wargaming Airborne Operations (published in 1977, and reprinted by the History of Wargaming project. My version is the American version printed in 1979). Dropping paper chits, but some chits can be heavier, simulating a more accurate drop (e.g. pathfinders that have to lay out the drop zone for the subsequent lifts). Featherstone even suggests dropping the markers with the lights out for night operations! A number of adjacent virtual tables to the real wargaming table, on which the troops land. The move towards the central table on subsequent turns. Moving a model airplane attached to strings across the table, while the paper chits fall out - although it is suggested it is far simpler simply to drop the paper chits from a box. The chits can be color-coded or bear an ID to see what troops have landed where. Various dice rolls are suggested for troops being wounded upon landing, or what to do when troops land in difficult terrain. Chance cards are mentioned as well to determine the height of the drop, deviation by winds, etc. Dropping paper chits above the table is great fun, and I have used it in various games set in various periods (WW2 to Scifi). Chits that don't land on the table mean the corresponding figures enter the tabel a few turns later, representing troops that were dropped outside of their designated landing zone and needed some time to get back to the main area of operations. An alternative is to use a scattering die roll, that indicates deviation from a chosen landing point. One can use a D12 die for direction, and 2D6 for distance, or something similar. On my gaming table, I often use Kallistra hexes. The designated landing point is a hex, and then a D8 is used for devaiation. A die roll of 1-2 means that troops land in the hex, 3-8 indicate the 6 adjacent hexes. When using a D20, one can include a 2nd concentric circle of hexes as well. Depending on circumstances (wind, anti-aircraft, height of drop), modifiers to the die roll can be used to make the drop more accurate. The problem with dropping paper chits is that they land all over the table, and that the resulting combat becomes very chaotic, especially on a small table combined with long weapon ranges. The whole idea of regrouping your troops before engaging the enemy is very difficult to play out under such conditions. Therefore, my preferential airborne mechanic is to use off-table landing zones. The sketch shown below, (taken from my notebook, listing all the games played in my wargaming room), illustrates the basic idea. Various landing zones are drawn around the table, in two concentric circles. If you look at the right-hand side, zones A, B, C, D and E are adjacent to the table, and zones I and II are one step further. Each squad that landed in this scenario was allocated to a single landing zone. A die roll of 1, 2 or 3 indicated the unit landd in the designated zone, otherwise it landed in an adjacent random zone (possibly on the table, and then troops would be placed along the table-edge). For determing a random adjacent zone, simply roll a D6, and start counting from a designated starting point. If there are less than 6 adjacent zones and the die indicates a non-existing one, roll again. Once the game has started, movement from zone to zone (or onto the table) takes 1 turn. Troops that are on the table can never return to any of the landing zones. The specific diagram was drawn based on the map for the main table, with a railroad and road delineating various sectors, and a river splitting the table in half. If a different lay-out is used, the zones and connection between them should of course be redrawn. Using such a diagram provides the player with some interesting tactical decisions. Landing zones for various units have to be decided, and at the same time, the mechanic also provides for deviations during the landing using an easy die rolling procedure. Once all landing points have been determined, various regrouping moves (on or off-table) can be spent before the assault on the actual objectives is started. I once considered paper airplanes that would glide elegantly onto the table, but the dimensions of the typical wargaming table do not make this very practical. However, for a wargame in the outdoors, this might be a fun alternative. Featherstone's book Wargaming Airborne Operations wasn't the first to mention the idea of dropping paper chits. His book Air Wargaming (1966) describes the same idea, and the idea has been mentioned in WRG's rules Armour and Infantry 1925-1950 (1973) as well. I will delve a little bit deeper in my wargaming library to look for older references, but if anyone can find any, please let me know! The boardgame Memoir 44 has a mechanism to drop plastic figures onto the hex-gridded gaming board. When dropping paper chits, you can also line them up on a wooden ruler, and then flip the ruler over, recreating all paratroopers jumping in sequence along the flight path of the carrier aircraft. The same idea can be used when using scattering diagrams on a hexgrid, by plotting the flight path along a series of hexes, and having troops jump out in subsequent hexes along the path, each jump followed by a scattering procedure. The game Starship Troopers (Avalon Hill, 1976) used this mechanic, as is shown in the diagram below. Some real food for thought there. Looked it up, and it seems they folded direction + distance in a single D6.